Reading the latest crop of books about Israel, a reviewer has the sense of reading half a book at a time. Each book is a polemic—for Israel, against Israel, or with policy imperatives of one kind or another—and each one is half intelligent and half drivel. 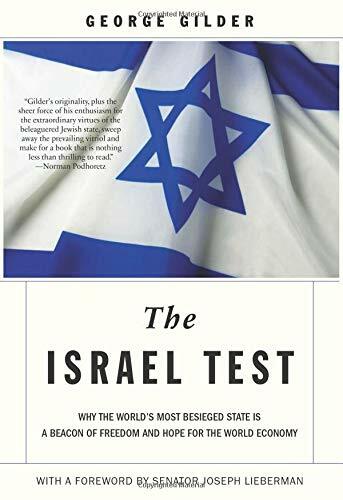 It is sad to see that George Gilder’s The Israel Test conforms to this pattern. The book provides a well-researched and intelligent argument defining Israel: Why the country exists; why it is important to the world, and to the U.S. in particular; and what its considerable gifts are. When Gilder is writing about Israel’s virtues, his arguments are cogent, supported by evidence, and profound. This much of the book is well worth reading. So it is a shame that all the rest of the book is drivel, some of errant nonsense, some of it rhetorical generalization, some of it out and out racist trash. Why the superb intellect that crafted all the useful and good in the book must descend from the sublime to the ridiculous is a question that only Mr. Gilder can answer. But it does seem to be an occupational hazard that afflicts writers who take up the history and sociology of this region. Look what happened to Chomsky! More serious characters like Alan Dershowitz have succeeded on a higher level, but we do not seem to find writers like him among the most recent group. Sadly, it is now at the crossroads in the history of Israel that serious thought about its future is most badly needed. We would like to highlight the really good in Mr. Gilder’s book, so let us very rapidly get past the rot. There is a lot of generalization about “Arabs” and “Jews” as economic actors. Few would deny that many Jews have contributed to economic prosperity in the U.S.—so have a lot of other members of other ethnic groups (we learn this kind of thing in high school civics, George). Claims of genetically higher intelligence for Jews (or anybody else) are notoriously racist and false. Claims that “Arabs” earns less money than others outside of Israel and the U.S. are ridiculous; what about in Saudi Arabia, Qatar, and the UAE, or for that matter in Europe or Australia? Attempts to ignore what happened to Palestinians in Israel—as though it were a myth—are pernicious and unhelpful. Putting this kind of rot into a serious book only shames the cause Mr. Gilder is trying to defend. There is also a strange chapter, a kind of hagiography of the scientist John von Neumann, who “was the unelected avatar of the Jewish triumph.” We also learn that Benjamin Netanyahu, a man we personally admire, “epitomizes the unity of the United States and Israel.” L’chaim, George. But let’s just ignore the silly stuff and get to what is useful in the book. The third chapter of the book reminds us that the Zionist settlement of Palestine, from the end of the 19th century until the Second World War, was largely accomplished by the purchase of land by Jewish settlers. With these purchases, they used technology to increase the value of their holdings and to make the communities around them more tenable. Mr. Gilder documents this well: The example of Petah Tikvah, which supported less than 400 people in 1878, grew to maintain a community of 20,000 by 1939 after Jewish settlers controlled malaria and developed citriculture there. The story was repeated again and again; and here the facts are documented. From 1914 to 1939, Jewish settlers acquired no more than six percent of land that had been previously cultivated by Arabs. Yet citing a non-Jewish historian “the country emerged from a backward low-yielding agricultural economy . . . toward a modern, scientifically directed, and richly diversified economy.” Again, citing good data, Mr. Gilder notes that the new economy attracted Arab immigration. Surely this is worth noting. Chapter four, on the Palestinian economy, contains much that is worth considering as well. Jewish settlement did not, in fact, drive out Palestinians. The war, in 1948, did that. That’s when the camps were first set up. Whether after the war it would have been possible for the refugees to remain in Israel is a fraught question to which Mr. Gilder does not give reasonable consideration. But he is right to point out that those Arabs who do live in Israel are not victims of economic prejudice; in fact, they earn more than their peers in the rest of the region. Mr. Gilder does not seem to understand that there can be other kinds of prejudice besides the kind expressed in terms of dollars and cents. But the chapter fairly documents that the refugee camps exist solely from aid from the United Nations Relief and Works Agency, and as a result have no real economy. Under Israeli rule, the West Bank and Gaza were oriented to private enterprise, and in fact prospered—this is well documented. Gilder is one of an increasing number of critics who question why the camps should continue to exist. It is a point worth making, even it if it is bound to be hotly contested. Then there are two excellent chapters, one reviewing Israel’s technology strengths and another recounting the modernizing of the country’s financial markets—this was done in close alliance with the U.S. The preface, by Senator Joseph Lieberman, points out that Israel shares much with the U.S. in terms of values and worldview. This is no doubt why the country remains popular with U.S. voters and why our government continues to support it. Gilder’s muscular defense of Israel is welcome. It is a pity he did not make it better. Andrew Rosenbaum has been a journalist for 20 years at Euromoney, TIME, and MSN Money, covering politics, business, and finance. He currently resides in France.